'We woke up to an absolute nightmare.' Family finds themselves trapped inside apartment after vandals destroy front door lock. A Beit Shemesh family had a rude awakening Monday morning, when they discovered that they had been trapped inside their own apartment. The family, which lives in the Yefe Nof neighborhood, found that the locking mechanism of the front door had been broken. After multiple attempts to force the door failed, one family member, Shlomi, was able to escape the house by climbing down from the porch. When he came back up through the building’s main entrance, he found the apartment’s front door was covered in graffiti, reading “An End to Immodesty”. The rest of the family remained trapped inside the apartment for hours, and were still unable to leave as late as 11:00 Monday morning. “We woke up to an absolute nightmare,” Shlomi told Mehadrinews. 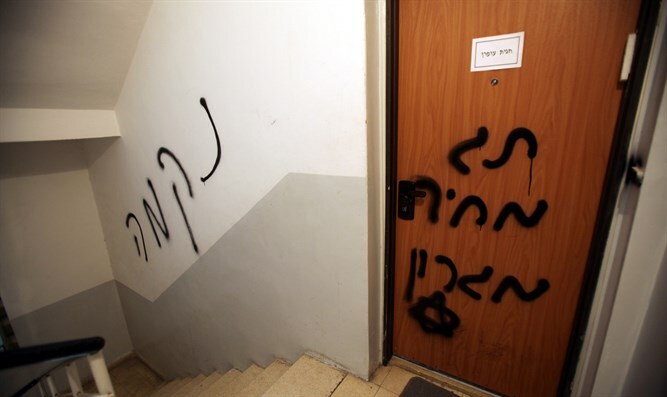 The vandals apparently targeted the family, which is traditional but not strictly haredi, because they claimed the children’s attire was “immodest”.